True to the University’s mission, SIUE alumni are achieving success in countless ways and shaping a changing world. Here are just a few recent alumni success stories. Visit Alumni in the News for even more alumni updates. Shawn Bell earned a master’s in public administration from SIUE in 2012. Since then, he has enjoyed a blossoming career in city management, including becoming the youngest city administrator in South Carolina in 2014, at age 28. Now, he oversees approximately 100 employees and an $18.5 million budget as the city manager/administrator for Fountain Inn, S.C.
Ed Hightower is among the eligible candidates for the Naismith Memorial Basketball Hall of Fame Class of 2018 announced in December. Hightower was a nationally recognized, award-winning NCAA basketball official for 36 years until retiring after the 2013-14 season. He has earned three degrees from SIUE, a bachelor’s in physical education in 1974, a master’s in education in 1977 and a specialist degree in 1991. SIUE emeritus music professor Johnetta Randolph Haley, who retired from SIUE as the SIUE East St. Louis Center executive director and who earned a master’s in music from SIUE in 1972, received the Lifetime Achievement in the Arts Award from the Arts and Education Council. Keith Tyronne Williams, who is one of the few people certified by Katherine Dunham to teach the world-renowned Dunham Technique and who worked as a dance instructor at the East St. Louis Center for Performing Arts Program, received the Art Educator of the Year Award. Williams earned a bachelor’s in theater and dance from SIUE in 1998. 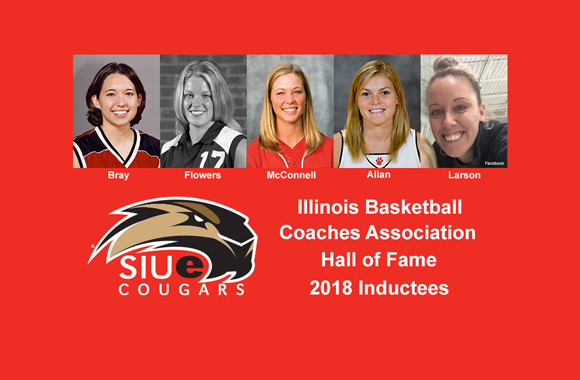 The DeShasier sisters will achieve a life milestone together as the three SIUE alumnae will be inducted into the 2018 Illinois Basketball Coaches Association (IBCA) Hall of Fame, along with two fellow alumae. The Carrollton natives include Stosha, Liz and Alicia. Liz DeShasier Bray played SIUE Cougars Women’s Basketball from 1999-2003. She earned a bachelor’s in speech pathology and audiology in 2003 and a master’s in speech language pathology in 2005. Stosha DeShasier Flowers earned a bachelor’s in business administration, with a specialization in finance, in 2001. She played one season for SIUE Cougars Volleyball in 2000. Alicia DeShasier McDonnell earned a bachelor’s in civil engineering in 2007. She played SIUE Cougars Softball from 2003-06. She was a first team All-American softball player during her senior season in 2006. She threw javelin for SIUE Women’s Track & Field in 2007. Alicia was a 2011 Pan American games gold medalist. Amber Shelton Allan earned a bachelor’s in physical education/teacher education in 2009. She played two seasons of basketball for the Cougars and earned honorable mention All-American honors during the 2007-08 season. Sarah Larson earned a bachelor’s in psychology, with a minor in criminal justice studies, in 2005. She played two seasons of Cougars Women’s Basketball.